Sewn, Assembled, Safety Tested and Approved, Packaged in the USA and Federal Safety (FMVSS) #209 & #302 Certified! FMVSS #209 and #302 Federally Safety Certified. Compare the Long Sash to a Standard Sash. 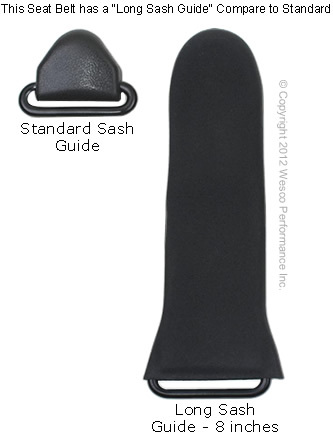 Click HereCompares the Long Shoulder Sash Guide That This Seat Belt Has to a Standard Sash. 3 point seat belt which includes both a lap belt and shoulder harness and it is retractable. 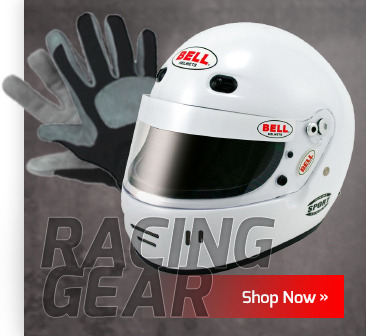 Sewn, assembled, safety tested and approved and packaged in the USA. Choose: Bench Seat Floppy 20 inch End, 8" or 11" Rigid Sleeve End for Normal to High or Low Bucket Seats. 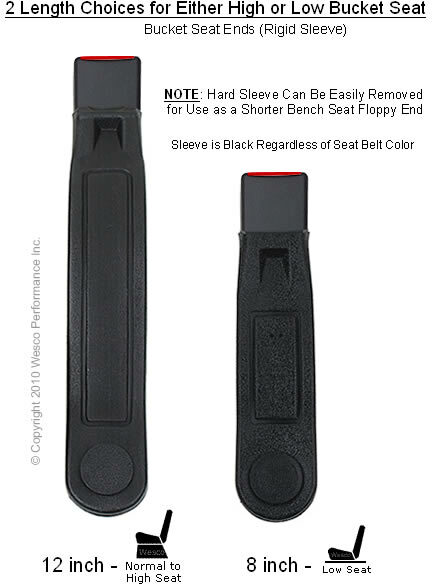 3 point seat belt (both lap and across shoulder) with End-Button-Release Buckle. Price includes 1 seat belt for 1 seat / person. Compare the installation instructions to your car, truck or van to confirm that this seat belt is vehicle compatible. Works for both passenger or driver side, front and some back seat applications. Webbing (belt) extends up to 134" out of retractor box. Retracts neatly out of the way when you unbuckle. Equipped with ELR Retractor What's That? For front seat installations with a high middle console (17" or more when measured from floor to top of console), one 6 inch extension bracket # 6-AB is needed for each seat belt installed (front seat). Click Here6 inch extension bracket needed for center consoles that are higher than 17 inches. to see how it attaches to the seat belt end. 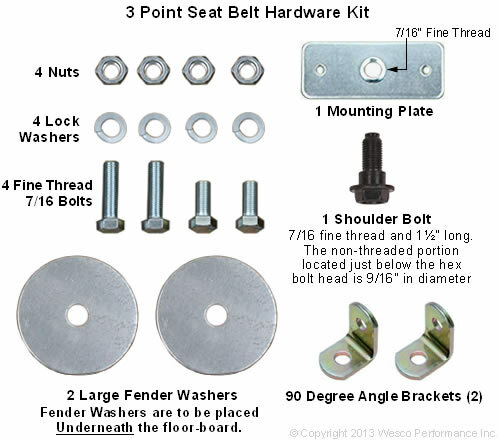 See our Seat Belt Hardware Page. IMPORTANT NOTE: Some colors of seatbelts have a different "C" end than pictured above Click to View Installation Instructions for these restraints. Note: These seatbelts do NOT have electrical wiring, so they cannot be electrically wired to alarms or airbags. great product, would highly recommend to anyone with an older r.v. Looks good bolted right up. Only problem is the upper plastic cover has no way to stay on. Keeps coming off. Seat belt looks original, color was as advertised. Took about 10 days to get to me and everything was as ordered. Seat belt is a little rough, but might just need broken in. Just a little short for my conversion van, but will work. Belts are fine. Taiwanese made retractors are of much better quality than their Chinese made counterparts. End fittings are cleanly plated new parts. Stitching is very good. My only comment is about the sash brackets. The webbing loop is too small consequently rubber cover is too loose giving a flimsy feeling about the whole thing. I suggest Seat Belt Solutions to stitch a heavier loop on the sash bracket. Also, make buckles (latch plates) on the webbing should be free-sliding type like modern seat belts with a stop button on the webbing, to improve the feel and function of the seat belts.